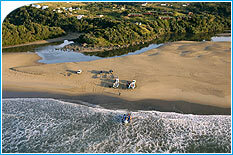 Situated at the mouth of the Mbotyi River and tidal estuary is Mbotyi River Lodge. Nestled between the rolling hills, lush tropical forest and the warm Indian Ocean, it is the perfect venue for anyone looking for a peaceful and tranquil holiday or for the adventurer wanting to explore the many beautiful and wild treasures this coast has to offer. The 48 upmarket rooms in the lodge consist of en-suite double and twin bedrooms in either of 36 wooden cabins or 12 thatch bungalows. 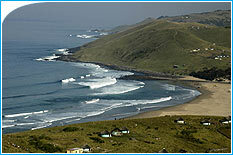 Mbotyi is situated 26 kilometres from Lusikisiki and the road is easily accessible by motor car. There is a small portion of gravel road, which is in good condition. A short distance from the turn-off lies the Magwa Tea Plantation and it feels as if the beauty of the valleys and hills of this magnificent tea plantation transports one back into history. After a very short drive, the landscape changes dramatically with deep gorges filled with lush vegetation, waterfalls and then comes the descent through the Mqaba Forest which is teeming with fauna and flora that is waiting to be discovered. 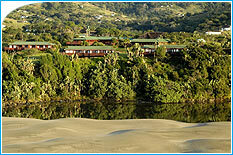 Mbotyi River Lodge is at the end of the road and the beginning of a new and wonderful adventure. 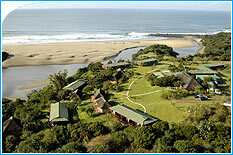 Mbotyi River Lodge has beautiful sea and lagoon facing rooms each with their own unique view and ambiance. Whether you prefer the rustic thatch or the log cabins, the rooms are comfortable, upmarket and cosy with en- suite bathroom. 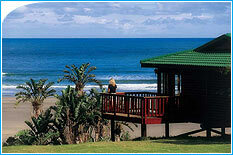 The 12 "upgraded" log cabin rooms have additional air-conditioning, television and bar fridge. 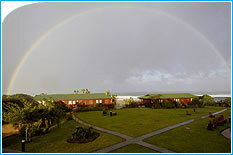 All the rooms have either a balcony or patio where guests can sit and hear the rumble of the ocean or the cry of the fish eagles while admiring the view of the forest, sea or lagoon. The focus of the Mbotyi River Lodge cuisine is on taste and quality. Yes, the emphasis is on simple dishes that delight the palate and enhance your day and stay. Breakfast comprises nourishing English style fare or, if you prefer, something less filling. Lunches are a tasty interlude of salads, pastas and paté. Dinners feature a wide variety of dishes to suit every palate, from seafood to steaks, from casseroles to wonderful chicken selections and hors de'oeuvres and desserts to bring you back again and again. The variety of cuisine is also reflected in the different themes: there are buffets and braais and for the more adventuresome - a picnic! The long bar and games room, situated adjacent to the dining room, enjoy awesome views of the Mbotyi beach and river mouth. Wicked shooters, tasty G & T's, bitterly cold beers and mineral waters are but a few of the favourites served. The literal translation of Mbotyi is Place of Beans. This is because the rich climate and fertile soils are conducive to the production of excellent beans. The history of Mbotyi River Lodge is equally fertile. A landscape in which time has stood still and which is breathtaking in its beauty is punctuated by romantic figures and strange occurrences. By piecing together some anecdotes from the past with a little factual information, it is hoped that the history of Mbotyi River Lodge will be brought alive.